Antique canning jars are colorful reminders of Grandmother's country kitchen. These jars come in a variety of shapes, sizes, and colors and are very collectible. Canning jars were an important part of the kitchen for well over a hundred years. Women used the glass jars to preserve fruit, vegetables, jellies and jams for the family to eat during the winter months. Since the jars were glass they were completely reusable and often handed down from generation to generation. European jars can be found that are from as long ago as the 1600s. In the United States, however, a variety of canning jars began appearing in the late 1840s. While stoneware crocks were used for many things, they did not enable the homemaker to seal the container securely and so the contents were always at risk. The first jars used sealing wax to create a tight seal. The wax was melted and poured into a channel around the lip of the jar. A lid was put in place and as the wax cooled a seal was created. The difficulty came when it was time to open the jar because the wax had to be melted so that the lid could be taken off. Regardless of this inconvenience, wax sealers were popular well into the early part of the 20th century. 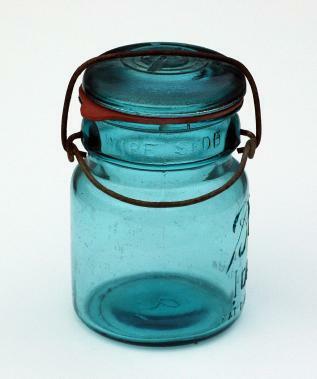 One of the most well known canning jars was the Mason jar, patented by John Mason in 1858. It had a screw-on cap. This made a more reliable seal that was easier to work with than the wax sealer. These jars are embossed with Mason's Patent Nov. 30th 1858. Collectors do need to be aware that these embossed jars were manufactured through about 1920. Just because your jar is embossed 1858 does not mean that it was manufactured in 1858. During the Civil War and later some manufacturers used a clamp and glass lid design. The jar has a cast metal wire that clamps down on a glass lid and holds it tightly in the neck of the jar. These were used with round gaskets to create the seal. The Kline Stopper was patented in 1863 and used a gasket to seal a glass stopper into the mouth of the jar. When the jar was heated the gasket and stopper were put on. A vacuum was created as the jar cooled and pulled the stopper into place and held it there. Consumers complained that it was difficult to remove the stopper from the jar. There are a few tricks you can use to find the estimated date of your jar. Mold seam - if the mold seam goes all the way to the top it is a machine made jar and probably made after 1915. Whether you are a novice or experienced collector you may enjoy this forum for canning jar collectors. You can ask questions, find answers, and learn a lot from the folks that post there. Collecting antique canning jars is a rewarding hobby. Just remember that as with almost any collectible, there are fakes and reproductions in abundance. Get a good price guide to help you identify and evaluate the jars you find.